One thing is clear: Radiohead don't simply "play a show," they curate an experience. For over two hours, Thom Yorke and company managed to put on one of the most singularly impressive sets that Osheaga has ever seen — and likely will ever see. 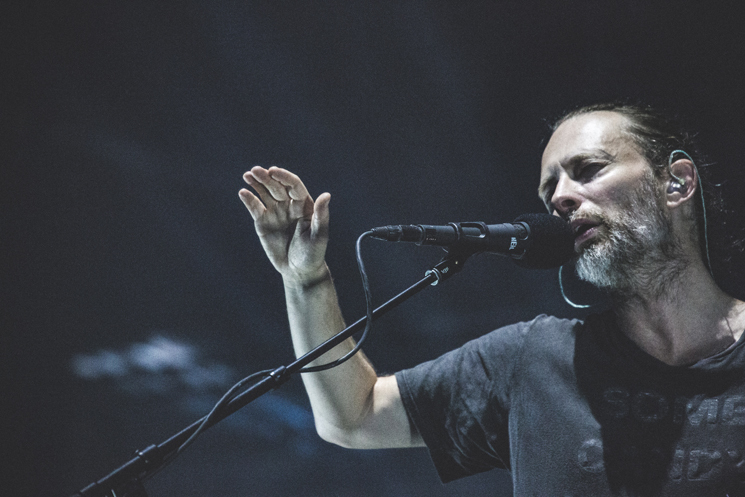 Touring their latest release A Moon Shaped Pool, Radiohead utilized their headlining slot to travel back over the course of their career and play songs that they felt like playing. Opening with their latest single "Burn the Witch," with Windows Microsft-era graphics projected on the 12 screens behind them, it was clear that while the sold-out crowd were packed onto the festival grounds like cattle, that this was, undeniably, the moment they had all been waiting for. Following up by "Daydreaming" and then "Ful Stop," Yorke coyly announced "okay, now that you're all away, we can begin." Starting with "2+2=5," and moving through "Pyramid Song," "Bloom" and ending their official set with "There There" — with the crowd looking on in awe, a few crying, mouths agape — it was clear that Radiohead could do no wrong. Leaving the stage, and coming back for the first of two encores after the massive audience emerged from their revered silence to cheer and scream, the band came back with crowd favourites "Paranoid Android" and "Karma Police," resulting in a sing-along that put all other sing-alongs to shame. For their true finale, Radiohead decided to end on none other than "Creep." While its no secret that Radiohead themselves despise this song, it almost seemed like an act of communal catharsis; the band ending on a track that fills them with hate, but that fills their audience with unadulterated joy. Intoxicating and unforgettable, Radiohead cast a glow over the crowd that seemed to loom for hours after they were gone.